In 2007 at Geneseo , NY , WWI lost power shortly after take off. Ahead of the pilot was a river with trees on both banks. Aiming for the only treetop gap, the aircraft snagged a high branch with the starboard wing and went straight down from about 60 feet. He walked away combining equal parts of stick & rudder work with luck. Every project needs a goal and one of the exciting parts of this project is the anticipation we all have for the new colour scheme. When C-GWWI was last painted there was no ready source for lozenge fabric. That is one of the practical considerations behind the previous colour schemes. The Berthold colouring only had day lozenge on the lower surfaces of the wings. To create this, the museum called upon its most valuable resource, enthusiastic volunteers, to hand paint the finish. This was accomplished by projecting a drawing of the lozenge pattern with an overhead projector and tracing the outlines. Each area was then hand painted with a brush. When you actually stand next to a thirty foot piece of Ceconite with all those little areas, you appreciate big solid coloured paint schemes. For the re-birth of C-GWWI, the museum has decided to go forwards with a paint scheme that is almost all 4 colour lozenge. To this end fabric was purchased from Ross Walton at Vintage Aero Fabrics and is currently in store. Here is what it will look like. This aircraft was flown by Lt. d. R. Richard Kraut with Jasta 63 in late 1918. ‘RK’ has specific Canadian significance, was a frontline aircraft and is a visibly dramatic departure from most German aircraft on the airshow circuit. Using this material and the doping required will actually decrease the weight of the airframe, a big plus. Colour profile courtesy of and copyright Rob Pearson. All fabric was stripped from the aircraft. The upper wing was intact, and careful examination found no structural damage. The fuselage was stripped to bare metal and was straightened or had structural members replaced, as necessary. It was then primed and repainted with epoxy paint in “Fokker green.” The original cowling was fiberglass and badly damaged in the crash. A more authentic all-metal cowling is being hand fabricated in-house. All metal panels around the nose were stripped of finish and checked, and are being restored to their original shapes. The tail was also stripped and examined for damage. A new rudder was fabricated, not due to any damage suffered but to modify the hinge placement. Again, the tail feathers were stripped to bare metal, primed and repainted in “Fokker green.” Most of the undercarriage was salvaged, and new struts fabricated from streamline tubing. New metal cowling being hand—fabricated by Great War Flying Museum personnel. A top overhaul was performed on the Ranger engine. When the engine was torn down and examined, no damage was found. New pistons and cylinders are being fitted. A new lower wing is under construction. New lower wing construction detail . 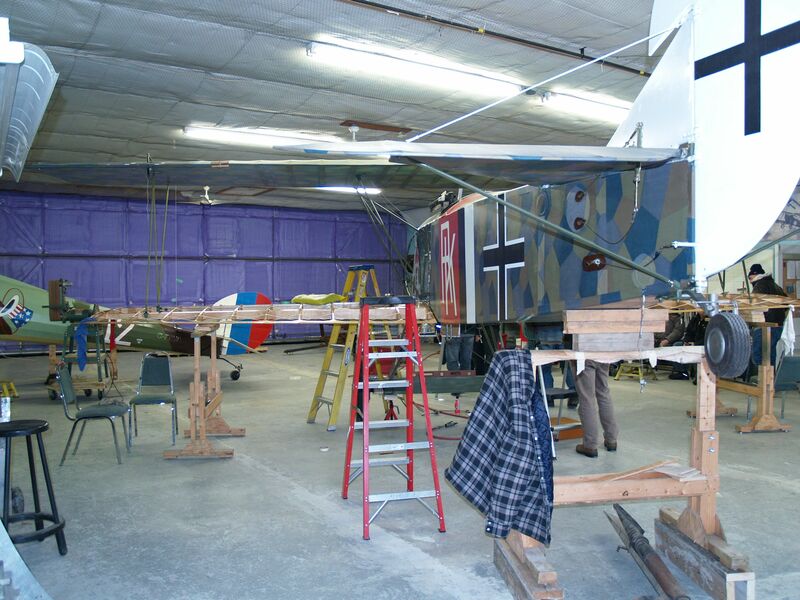 To date, the upper wing has been re-covered and doped, and is mounted on the cabanes. 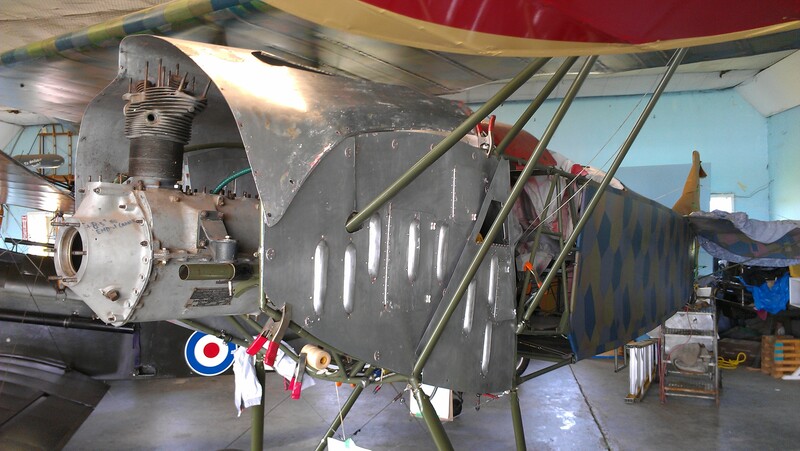 The tail feathers were also recovered and finished, with national markings applied to the rudder. A section of the rear fuselage has also been covered. All new control cables were installed as the upper wing and tail were rigged. The aircraft is sitting on her wheels in our hangar as work on the fuselage proceeds. Tail and new rudder, covered, finished and mounted. General arrangement showing mounted upper wing and lozenge to good advantage. Fuselage is now partially covered, cowlings and engine being checked for fit. The lower wing is temporarily fitted to check attachment point alignment. Once everything is true, it will be removed to be covered. At the business end, work on the engine proceeds. The metal work on the front end has been completed, fitted and finished in “Fokker green.” Pretty soon we will be able to put the rest back together. After many years of dedicated work by members of the museum, our D.VII took to the skies for her first test flight on October 25th 2018.